Last week I mentioned that one of my goals for this year is to read 75 books. 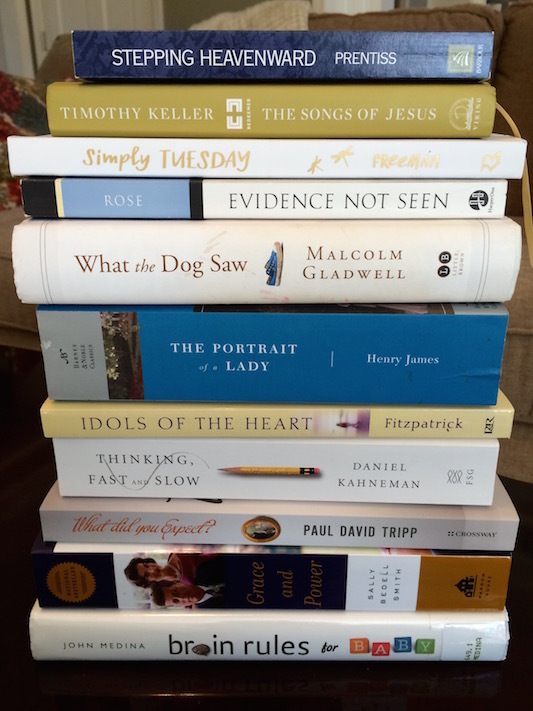 I thought today I would share some of the nonfiction books on my reading list for this year. The majority of what I read is fiction, and the books I choose come from a variety of places: what my book club is reading or what has been recommended by friends, bestseller lists, blogs, etc. Because of this, I don't ever know which fiction books I'm going to end up reading through the year. But I keep a running list of nonfiction books that I'd like to read, so here they are for this year, in no particular order. Stepping Heavenward // I read this book my freshman year of college, but recently I've heard my mom and sisters all comment on how much they enjoyed reading this. I thought it was time to pick it up again. The Songs of Jesus // This is a yearly devotional that works through the Psalms. I typically read a Psalm each day as part of my devotions, so I'm enjoying this book with the short devotional and prayer that is with each portion of the Psalm. Simply Tuesday // My sister has mentioned more than several times how much she likes this book, and I've also recently enjoyed reading Emily's blog and following her on Instagram. I've not read any of her other books, but I've definitely heard the most about this one. Evidence Not Seen // This is one of those books that I thought that I had read, but it turns out I haven't. It's been on our shelf for several years, and Caleb has told me things about it, but I'd like to read it for myself. What the Dog Saw // I really enjoy reading Malcolm Gladwell's books, and somehow I've read all of them but this one. The Portrait of a Lady // My goal each year is to read a piece of classic literature. It usually takes me a while to get through them, but I always enjoy reading them. I randomly picked this one off of my shelf. I don't even have any idea what the story is about, but I hope I like it because it's 600+ pages. Idols of the Heart // I have enjoyed all of the Elyse Fitzpatrick books that I have read, and I'm sure this one will be challenging and eye-opening. Thinking Fast and Slow // Nerd alert: I love reading books on the brain and how we think and process things. I've had this book for a little while now, but have just not gotten around to reading it. What Did You Expect // I have read a lot of books on babies and parenting over the past year, but I haven't read one on marriage in a while. All I know about this book is that it discuss the realities of marriage versus the expectations, which sounds like it will be a good read. Grace and Power // A couple of years ago I read a biography on Queen Elizabeth by this same author, and I absolutely loved it. The Kennedys have always intrigued me, so I'm looking forward to learning more about them. I told Caleb that just like when I read the book on the Queen, all he will hear about for the chunk of time I'm reading this is random details and facts on the Kennedys. He's been warned. Brain Rules for Baby // Reading books on babies and parenting has been so enjoyable for me. There's so much to learn! And even if you decide you don't agree on the stance of the book, it's good to just be informed. Parenting a child is no small thing, so why not learn as much as you can? This list looks great! I love reading non-fiction. I got Thinking Fast and Slow for Christmas after hearing about it from a classmate. What is crazy to me is that the author is a pyschologist but won the Nobel Prize in economics... beast! Good List! I've got a small running list too. My goal is one book a week this year. So hopefully around 52! I don't know how I missed this post, but I love your picks! You always inspire me with your voracious reading, and now I have some to add to my list. The Kennedys have intrigued me as well so I may need to give that a try!